Anyway, current polls give the ruling Conservative party way ahead with 43%. The Labour Party (who are supposed to be the main opposition, but have been in a state of chaos for quite a while now) have 25% $-$ this is compared to the results at the 2015 general election where the Tories got 37% and Labour 30%. As if the situation weren't bleak enough for people of the left-ish persuasion (with Brexit and all), this doesn't seem to be very good news and many commentators (and perhaps even the PM herself) are predicting a very good result for the Tory, may be even a landslide. 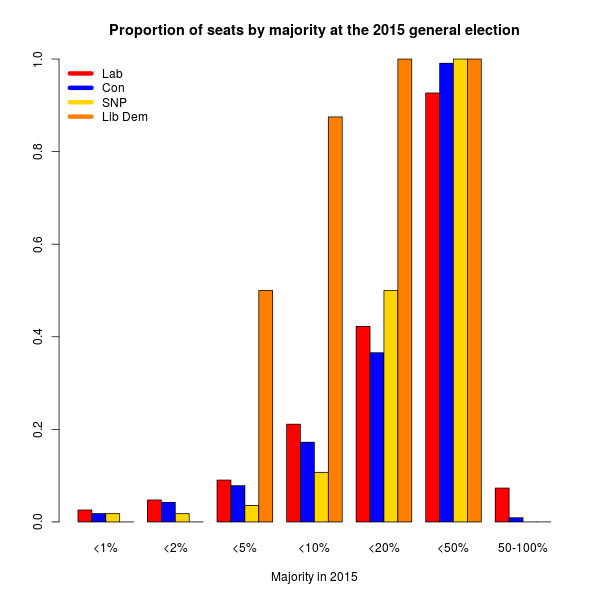 But because of the electoral system, may be the last word has not been said: the fact is that the UK Parliament is elected on a first-pass-the-post basis and so Labour may not actually lose too many seats (as some commentators have suggested). I went back to the official general election data and looked at the proportion of seats won by the main parties, by the size of the majority $-$ the output is in the graph below. The story is that while there are some very marginal seats (where Labour won a tiny majority just two years ago), a 5% decrease in the vote may not be as bad as it looks $-$ although the disaffection with Labour is not necessarily uniformly distributed across the country. 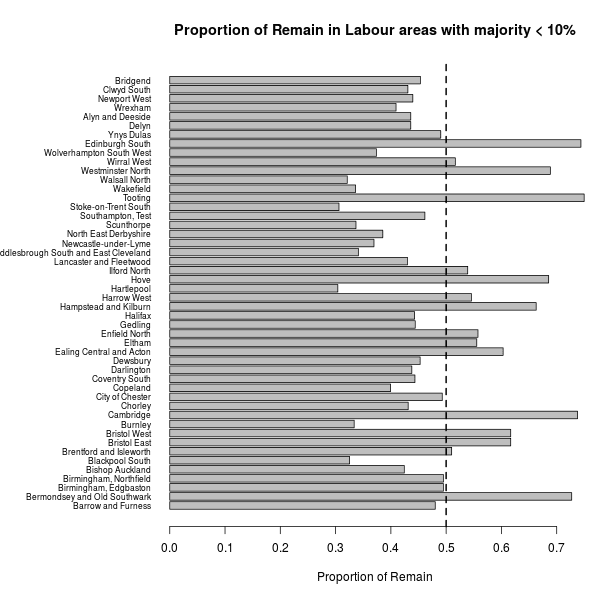 More interestingly, I've also linked the data from the 2015 General Election with last year EU referendum $-$ one of the main arguments following the Brexit outcome was that the Remain camp were not able to win in Labour strongholds, particularly in the North-East of England. (I know I have way too many significant figures here, but I thought it'd be interesting to actually see these values). So, apart from Ealing & Acton (strong Remain), there may be a good chance that the other four constituencies be made by people who are fed up with Labour and could be voting for some other party. When you actually consider all the constituencies with a Labour majority of less than 10%, then the situation is like in the following graph. Indeed, many of these are strong Leavers, which may actually be a problem for Labour. A few, on the other hand, may not be affected so much (because the "Remain" effect may counterbalance the apathy for Labour) $-$ although it may well go the other way and parties on a clear Pro-EU platform (eg the Lib Dems) may gain massively. At the other hand of the spectrum, the corresponding graph for Conservative-hold areas with small majorities is like in the following graph. 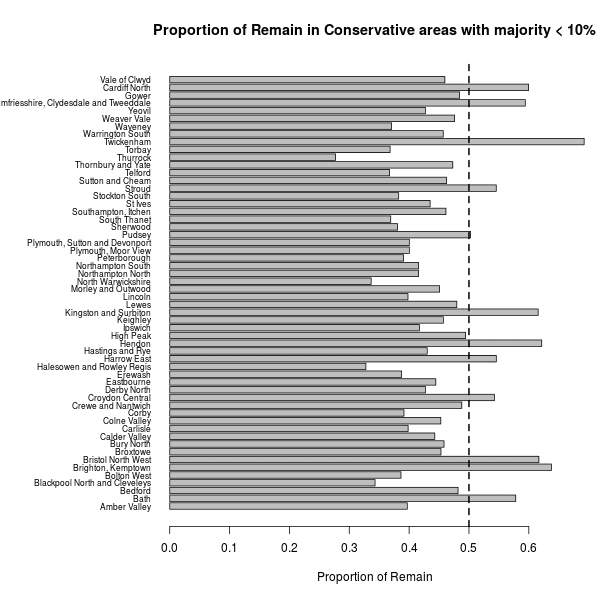 For the Tories, the problem may be in Remain areas where they have a small majority $-$ there aren't a massive number of them, but I guess about 40% of these may be fought very hard (because they are relatively close or above 50% in terms of the proportion of Remain)?